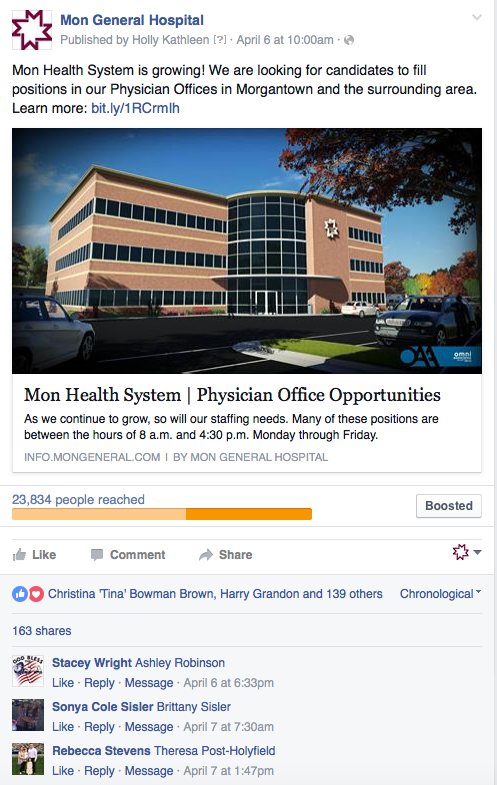 What is the best way to use your website and social media to attract candidates for open Healthcare positions? There are many ways to answer that question. Sure, you can hire a high-priced HR firm, you can run ads in the newspaper, you can target your audience through healthcare trade journals and so on. At InnerAction Media, we are well versed in implementing strategic, cost-effective solutions to get results. Healthcare recruitment marketing is one of our sub-specialties. Recently, we worked with one of our clients to launch a social media campaign and website strategy for a 200+ bed hospital and healthcare system. The landing page was promoted on social media, specifically Facebook and only $10 was spent promoting the page (see below). 2,696 people visited the website landing page. Of those 2,696 visitors, 634 of them visited our form submission page to learn more information. Remember--it’s not just about using social media. It’s about using it, in this case Facebook, to drive the target audience visitor to a landing page on your website. Then, by using a compelling message, they will want to take action. Take an in depth look at how landing pages in a previous blog of ours here. It’s pretty simple, yet at the same time, takes a lot of experience, coordination, time and know-how to be effective and get the results you are looking for. I hope this helps you in your healthcare recruitment efforts.